Ice cream and a Hawke’s Bay summer go hand in sticky hand. Wherever a leisurely day might take you, you’ll never be far from a frozen treat. From fresh fruit used in street-stall fro-yo, to the development of New Zealand’s oldest ice creamery, to the handmade artisans who make up an essential part of the Bay brand, in ice cream there’s a narrative that illustrates perfectly Hawke’s Bay’s position as premium food producer. At almost every fruit stall from Berry Tasty in Bayview to Havelock’s Strawberry Patch there’s a squeeze machine that pumps out frozen yoghurt (or plain ice-cream) laced with fruit. In our fruit-heavy months the excess gets frozen down and kept to be pushed into cones and sold on to customers. Buying fresh strawberries is now intrinsically linked with buying ice cream this way. Fruit stalls have found a way to sell us extra product, some of it out of season. That innovative approach to making full use of our assets is a microcosm of what’s happening in all parts of the ice cream sector in the Bay. New Zealand’s oldest ice creamery, Rush Munro’s, opened here in the 1920s. Its famous ‘ice-cream garden’ is still bustling after 90 years in Hastings. Recent rebranding has embraced the heirloom styling of the garden, referencing the roses and trellis that are now iconic. But those working on the inside of Rush Munro’s have their eyes on the future as much as on the past. Vaughan Currie is the general manager brought on by owner John Bostock to steer the company into the 21st century. Fitting for anything hanging under Brand Bostock, Rush Munro’s is slowly going organic with six flavours recently released. It seems a simple thing. 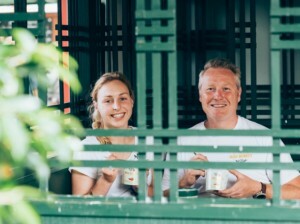 Rush Munro’s was predominantly organic ‘back in the day’, but supply chains and producers have changed and delivering organic ice cream is far from easy. For one flavour alone eight organic producers contribute product, everything from orange peel to chocolate. “The challenge is we need to source ingredients, then source them again and again,” says Vaughan. There are holes too in the organic supply chain; some work happens onsite to ensure a flavour can be delivered as ‘organic’. For example, there are no organic almonds sold in New Zealand as slivers or pieces, only whole, so the almonds found in the scorched almond ice cream are all chopped at the Rush Munro’s factory in Hastings. “With the ginger kisses,” Vaughan explains. “We have to smash them ourselves”. Coffee is brewed onsite too, for the mochaccino variety. For a big brand that’s available nationwide Rush Munro’s is still very much hand-crafted with some Number 8 ingenuity needed to stay true to the organic vision. By not skimping on that, Rush Munro’s is one of the offerings spearheading the evolution of the organics market in New Zealand. To mature an industry, diversification is needed. “Organics can’t just be confined, it needs to move up the supply chain and provide more food groups so it’s more available to people,” Vaughan says. To the extent consumers want organic, brands like Rush Munro’s want to meet that need, but there’s a whole range of smaller producers – who in the past have only provided finished products – whose own businesses will grow as the entire industry gets more sophisticated. 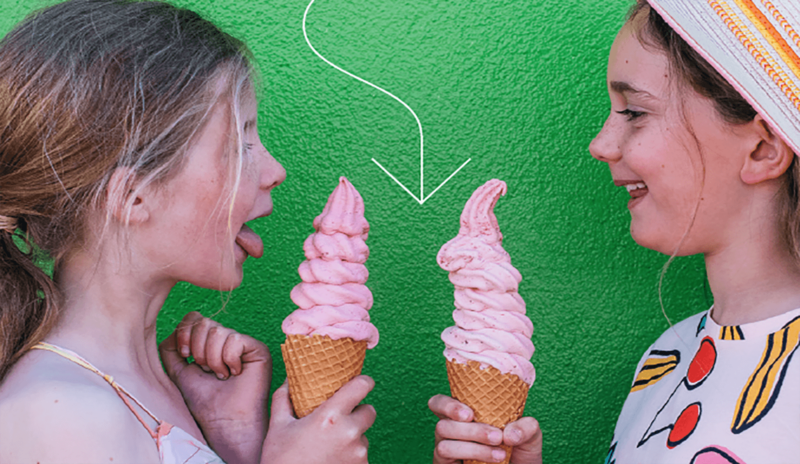 With Hawke’s Bay the ultimate summer holiday destination, providing the perfect scoop-in-a-cone is an essential community service. The two ice cream parlours that bracket Marine Parade are postcard-perfect examples of the type: Lick This at one end and Cool Chick beyond the port at East Pier. The latter screams childhood and caters to every demand, from banana splits to donut sundaes, in a kaleidoscope of flavours, toppings, sprinkles and cones. Dominated by mass market brands, it’s the chance to eat ice cream on the beach or on the swings that pulls the crowds. It seems kids care less about flavour and more about location when it comes to ice cream. For the real frozen treat gourmand Lick This has the other beaten. Owned and operated by the same family for 12 years, all their product is made onsite, although they do hold nostalgic freezer space for some Rush Munro’s flavours. Caroline and Steve Manning are a prime example of a Hawke’s Bay couple doing it for themselves, opting out of the regular 9-5 model of ‘working for the man’ and putting their purse where their passion is. Steve gave up his ‘real job’ to concentrate on Lick This, learning the gelato-making trade, adapting it to the Kiwi palate and slicing out their own piece of the Hawke’s Bay dream, walking distance from the beach. As well as being one of Hawke’s Bay’s best have to smash them ourselves”. Coffee is brewed onsite too, for the mochaccino variety. Steve gave up his ‘real job’ to concentrate on Lick This, learning the gelato-making trade, adapting it to the Kiwi palate and slicing out their own piece of the Hawke’s Bay dream, walking distance from the beach. As well as being one of Hawke’s Bay’s best gelatai Steve is also a wealth of knowledge on the subject. Amid his collection of 500 antique ice cream scoops he shares stories from the ice cream world from the history of the ‘penny-lick’ to the fat-to-fruit ratio that makes the perfect scoop. 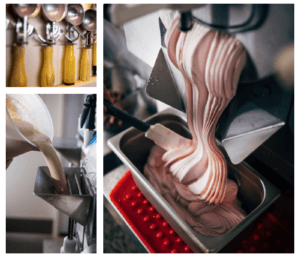 This DIY delivery of gelato, but on a large scale – Lick This rolls 300,000 scoops a year – is very Hawke’s Bay, particularly as it incorporates only locally-grown ingredients. To support it Steve finds new markets for his product, alongside the busy parlour, and new flavours to entice and excite the customer base. Bacon, maple and banana was a flight of fancy that stuck; Avocado though was one step too far and after a limited run was taken off the blackboard, never to return. Seasonal fruit is an important part of the process with the more unusual flavours such as rhubard sitting alongside the regulars like feijoa. A short walk towards town another gelateria gives Hawke’s Bay a hint of a future with more immigrants joining the community. 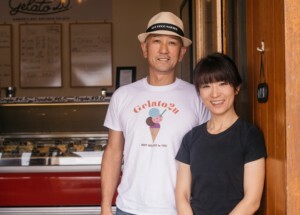 Nori and Emiko Ninomiya have been running Gelato 2U for about a year with Emiko at the helm and Nori, a winemaker by trade, lending support. Their tiny shop is a flavour bomb with 16 tubs on offer, many dairy- and gluten-free. Choices change frequently. “Flavour is a never-ending story,” laughs Nori. “We always have more coming and we vary it day-by-day, week-by-week.” The customer-base, even in the busy summer season, is over half locals, with many making the trek over from Hastings specifically for a scoop of their favourite. Most exciting to see are the careful first steps towards bringing a Japanese-Italian flavour fusion to Hawke’s Bay. Their matcha tea gelato is very popular, miso is in the experimental stages, but the pick is damson plum made with local fruit but distinctly reminiscent of ume, the Japanese preserved bitter plum. 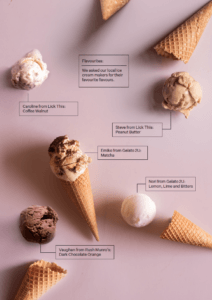 Hawke’s Bay’s culture of artisan producers, its commitment to the best local ingredients, its organic and premium produce aspirations, and its love of fresh fruit can all be seen through ice cream tinted lenses. Out and about this summer savour the flavour, but also celebrate this prime example of Hawke’s Bay at its best.